Apoorva M N Post Graduate Scholar, Department of Post Graduate Studies in Shalakya Tantra, Shri Kalabyraveshwara Swamy Ayurvedic Medical College, Hospital and Research Centre, Bengaluru, Karnataka, INDIA. Hamsaveni V Professor, Department of Post Graduate Studies in Shalakya Tantra, Shri Kalabyraveshwara Swamy Ayurvedic Medical College, Hospital and Research Centre, Bengaluru, Karnataka, INDIA. Foreign bodies represent a common cause of eye related complaints for adult and paediatric patients presenting to primary care physicians and ophthalmologists. Corneal foreign body is defined as any microscopic or macroscopic material from the external environment which may lodge in the cornea - the anterior transparent part of the eye that overlies the anterior chamber. Patient of corneal foreign body is frequently self-evident by history that is foreign body sensation, pain, photophobia and lacrimation. Decreased vision may also be reported in few patients. The Lakshanas explained under Sashalya Netra in Ayurveda can be correlated with the Corneal foreign body. Here is a case report of Corneal foreign body which was successfully treated with Ayurvedic treatment principles with Mahatriphaladi Ghrita Aschyotana and Yashtimadhu Ksheera Paka Seka for 6 days after its removal. There was a complete relief in Signs and Symptoms after the treatment. Hence the treatment protocol can be adopted in cases of corneal foreign body. M N, Apoorva; V, Hamsaveni. AYURVEDIC MANAGEMENT OF CORNEAL FOREIGN BODY - A CASE REPORT. 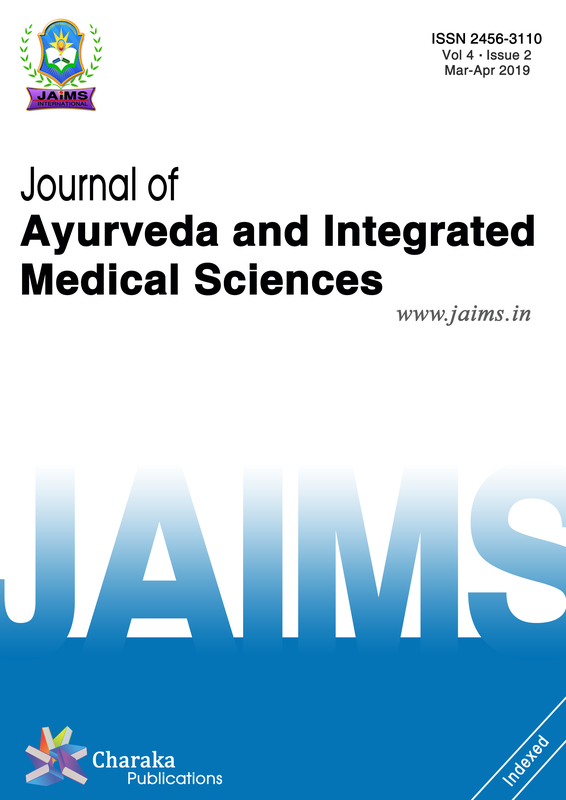 Journal of Ayurveda and Integrated Medical Sciences (ISSN 2456-3110), http://www.jaims.in/index.php/jaims/pages/view/Citation, v. 3, n. 5, p. 201 - 204, nov. 2018. ISSN 2456-3110. Available at: <https://jaims.in/index.php/jaims/article/view/663>. Date accessed: 25 apr. 2019. doi: https://doi.org/10.21760/jaims.v3i5.13844.